Written by: Priya Potapragada on October 17, 2016. Most of us are aware of it, we condemn it, we even try to be part of the solution, but can we really imagine how different our daily lives would be if we would have to worry about access to clean water? Suddenly, basic tasks such as washing, cleaning and cooking take on a new level of complexity or are simply impossible. Income-earning ventures such as farming or animal husbandry could end up impossible to sustain. This is the devastating reality for a substantial part of earth’s population. The United Nations reports over half a billion people around the world struggle to gain regular access to safe water, particularly in sub-Saharan Africa. Every day across the continent, millions of families face these exact problems. In fact, in some rural areas in Africa, gathering water can become a day-long chore, equating to walking miles and miles a day carrying heavy containers of water. In Africa, 90% of the effort and time invested in gathering water is that of women , further perpetuating inequality problems between men and women. According to the World Bank, the combined distance walked to collect water in South Africa alone – mostly by women – is equidistant to walking 16 times to the moon and back every day. The cumulative time spent collecting water is 6.4 million hours a day. Considering that these numbers account for only one of Africa’s 54 countries, the total figures reach near unfathomable levels! Historically, women gathering water have done so by carrying a 5 gallon (approximately 42 lb)container on their head. The incredible physical stress this places on the body over such a long duration results in serious fatigue and musculoskeletal problems in the long run. Furthermore, women and young girls collecting water run the increased risk of assault, sexual violence and disease. Debilitating or life-threatening physical risks aside, it goes without saying that time spent collecting water could be far more productively spent seeking an education, holding a job, taking care of the family, or simply enjoying leisure time. Perhaps more than any other socio-economic factor, the journey to fetch water is one the greatest impediments to gender equality in Africa. Enter the Hippo Water Roller Project. 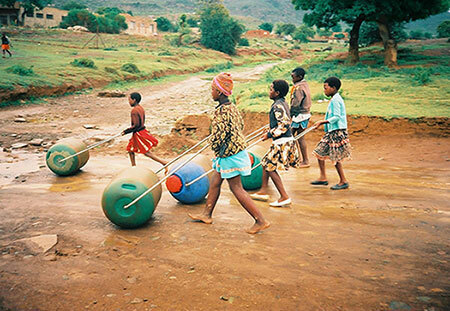 Established in 1994 by two South African entrepreneurs “in response to the unique needs and constraints in terms of access to water of rural women and children across Africa”, the Hippo Water Roller is a beautifully simple and cost-effective creation which allows people to collect and transport five times the usual amount of water – exceeding 200 lbs – over difficult terrain. The utilitarian design is, essentially, a thick-polyethylene barrel on its side with a steel handle which allows for the full barrel to be quickly and easily pushed, thus transporting 5 times the amount of water in far less time than it would take otherwise. Hippo Water Roller also addressed the need for farmers to irrigate their crops and included a unique “utility cap” in the product design which lets small-holder farmers efficiently water their crops as the Roller goes by. The sturdy material of each Hippo Water Roller ensures at least a year’s worth of solid use before it requires any sort of maintenance, making it the ideal tool in an unforgiving African landscape. Since its inception, the Hippo Water Roller Project has distributed nearly 50,000 Rollers, positively impacting almost half a million people – that means nearly 2 billion gallons of water transported over 300 million miles! Empowering women on an individual level and communities at large, the solution provided by the Hippo Water Roller Project contributes significantly to achieving the Sustainable Development Goals 5 & 6: Gender Equality and Clean Water & Sanitation. Such is its success at improving the quality of life for families all over Africa that the Hippo Water Roller Project has the distinction of winning a number of awards including the 2016 Frost & Sullivan Best Practices Award and the Design for Development Award in 1997. The challenge? Despite its undisputed success, the project continues to face a main obstacle, as most of the people who need a Hippo Water Roller simply cannot afford one. In fact, 95% of all Rollers in use today are donor funded. Between 2014 – 2016, The Hippo Water Roller Project was able to utilize the $17,500 granted by CAF America to provide Hippo Water Rollers to a poultry farming community in Nampula, Mozambique and to raise funds for a publicity and awareness campaign where a Cargill employee climbed Mt. Kilimanjaro while pulling a Hippo Water Roller. Visit the Hippo Water Roller Project website here.